On arrival at Hanoi’s Noi Bai Airport, you are met and transferred to your hotel. The capital of Vietnam, Hanoi is a stylish and gracious city that retains a unique old world charm and some Asia’s most striking colonial architecture. The many lakes and parks make for relaxing atmosphere. If time permits you can stroll around and discover the delights that Vietnam has to offer. It’s also nice to have a short cyclo ride through the bustling old quarter streets named after the specific goods once offered for sale at these places. In the evening, enjoy a welcome dinner at local restaurant, followed by the famous water puppet show with the spectacular techniques of performance. Breakfast at hotel, then embark on city tour with Ho Chi Minh’s Mausoleum and “House on stilt” at the same area with the Presidential Palace and the famous One Pillar Pagoda. We also make a visit to the Temple of Literature – the first university of Vietnam, which is now dedicated to Confucian worship before lunch. In the afternoon, continue our journey to the non –touristy ancient village of Duong Lam. Here, from the 16th century, the houses and walls are made of unprocessed Laterite blocks. The long-standing community has a dense population and houses nestle cozily next to one another. The stone of which they are built appears everywhere, both under and above ground. Tramping down quiet country lanes where to each side moss-grown Laterite walls and closed gates create a thoughtfully poetic atmosphere, we gradually recognize the value and the unique beauty of Duong Lam commune. After tea with a local family, we then continue our trip to Mia Pagoda, known as the Museum of Buddhist Statues, due to the 287 relics on display. In the morning, you will be picked up at your hotel and transferred to Halong Bay, about 170 km east of Hanoi (approximately 3,5 hours). Upon arrival, you will embark on a traditional wooden Junk for the beautiful cruise on the world heritage site - Halong Bay. You will enjoy a delicious seafood lunch served on board; then it is your pleasure time for swimming and sunbathing. In the evening, you will have dinner on board whistle watching sunset. Tonight, you will experience memorable overnight on board. We depart Hue by private car for the scenic journey to Hoi An, via the Hai Van Pass, an incredibly scenic and mountainous stretch of highway with spectacular views of Lang Co Beach. Hoi An itself is a charming small town 30km south of Danang. We will undertake a guided walking tour of Hoi An, a wonderful way to explore this small picturesque town. Strolling through the narrow winding streets of the ancient quarter, you will see the various Chinese Assembly Halls, Ancestral Homes, the Japanese Covered Bridge, and well-preserved Pagodas. During your time in Hoi An, you may like to visit a local tailor and be fitted for some very reasonably priced clothes. Alternatively, you can organise an optional day tour to My Son, a major Cham site around one hour outside of Hoi An. These historical ruins are now a UNESCO World Heritage Site. If all of this sounds too strenuous, you can always spend the day by the pool or head to the nearby Cua Dai beach, a flat bike ride away. Or, test your cooking skills at a Vietnamese cooking school. 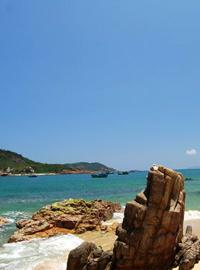 After breakfast, we take a day train to Quy Nhon, a coastal city in the Binh Dinh Province of central Vietnam and has a diversified landscape with a big lagoon area and valuable culture. This is a great time for relaxation at unspoiled beaches but non –touristy beside free time to explore the peaceful town. Lunch box on board. Upon arrival, transfer to hotel in Quy Nhon for two nights’ stay. Today, we will visit the local market and head to Tay Son for nice visit at Quang Trung Museum. Enjoy the show of Tay Son Traditional Martial Art, 12 Battle Drums of Tay Son Dynasty as well as traditional music and dance of Tay Nguyen ethnic. In the afternoon, visit Twin Towers built at the end of the 12th century, Thi Nai Lagoon, Phuong Mai Peninsula, Nhon Hoi Bridge over 2,500m long, spans across the lagoon. It is the best long the North –East. You are free to relax or explore the city independently. In the morning we will departure for the Cu Chi Tunnels. The Cu Chi Tunnels are an impressive network of tunnels with a length of over 250 km. This strategic place was used by 15,000 Viet Cong fighters during the war. A section of the tunnels has been widened to allow tourists to get a feel for what the life underground must have been like (please note that this will be hot and sweaty and also a bit claustrophobic!). In the afternoon, we will visit highlights of Saigon including the Central Post Office, the Notre Dame, the Reunification Palace. The last stop is Ben Thanh — the central market for the city and one of its liveliest and most colorful areas. At 8 hours, you will be picked up at the hotel and transferred to Cai Be; from here we board our river boats for a cruise along the endless waterways of the mighty Mekong. You can interact with local people, visit local houses with unique structure specific to southern countryside and some hand – made family business products coconut caramels, noodle, rice –paper. One of our stops will be to a small restaurant serving the local delicacies on the river. We arrive on an island near Vinh Long, where you will stay overnight in a local homestay, a small house situated on the waterways and surrounded by fruit gardens. The facilities here are basic, with everyone sleeping in a large communal room, but the experience is unique in that it offers you a chance to live the way the local people do. All bedding is provided including mosquito nets. You can relax in a hammock and soak up the local way of life, or join to prepare dinner by catching shrimps and fish with the local family. After breakfast, we bid farewell to our hosts and cruise to big river. On the way, we will visit Vinh Long market, Tien Chau pagoda and fish- raft village. Boat trip will end at around 11am in Vinh Long where our waiting vehicle will drive us back to Saigon. A transfer to the airport for flight home. End of services by Indochina Travel Service.